Legacy® hat with purple & gold Williams College on the front, cow mascot on the left side and Ephs on the back. Fabric strap adjustment in the back. One size fits most. Purple. Nike® hat with purple & gold Williams and Nike swoosh embroidered on the front. Fabric strap adjustment in the back. One size fits most. Purple. Nike® hat with purple & gold Williams and Nike swoosh embroidered on the front. Fabric strap adjustment in the back. One size fits most. White. Nike® hat with purple & gold Williams and Nike swoosh embroidered on the front. Fabric strap adjustment in the back. One size fits most. Anthracite. Nike® hat with purple & gold Williams and Nike swoosh embroidered on the front. Fabric strap adjustment in the back. One size fits most. Khaki. Nike® hat with purple & gold Williams and Nike swoosh embroidered on the front. Fabric strap adjustment in the back. One size fits most. Black. Nike® hat with purple & gold Williams and cow mascot embroidered on the front. Fabric strap adjustment in the back. One size fits most. Purple. Nike® hat with purple & gold Williams and cow mascot embroidered on the front. Fabric strap adjustment in the back. One size fits most. Black. Nike® Aerobill, Dri-Fit hat with with raised purple & gold W embroidered on the front, mesh back and small gold Williams embroidered across the back. The Aerobill is lightweight, breathable and comfortable. Stretch fit fits most. Purple & black. Nike® Dri-Fit hat with raised Williams Ephs design on the front and Williams on the back velcro adjustment. One size fits most. Purple. Nike® Aerobill, Dri-Fit hat with with raised purple & gold W embroidered on the front. The Aerobill is lightweight, breathable and comfortable. Velcro adjustment in the back. One size fits most. White & purple. Adjustable hat with cow mascot. Gold, purple, white, navy or putty (pictured). Adjustable hat with W on the front, Williams across the back. Black. Adjustable hat with Williams and swoosh. Navy. Adjustable hat with Williams and swoosh. Stone. Adjustable hat with Williams and swoosh. Purple. Adjustable hat with Williams and swoosh. Gold. 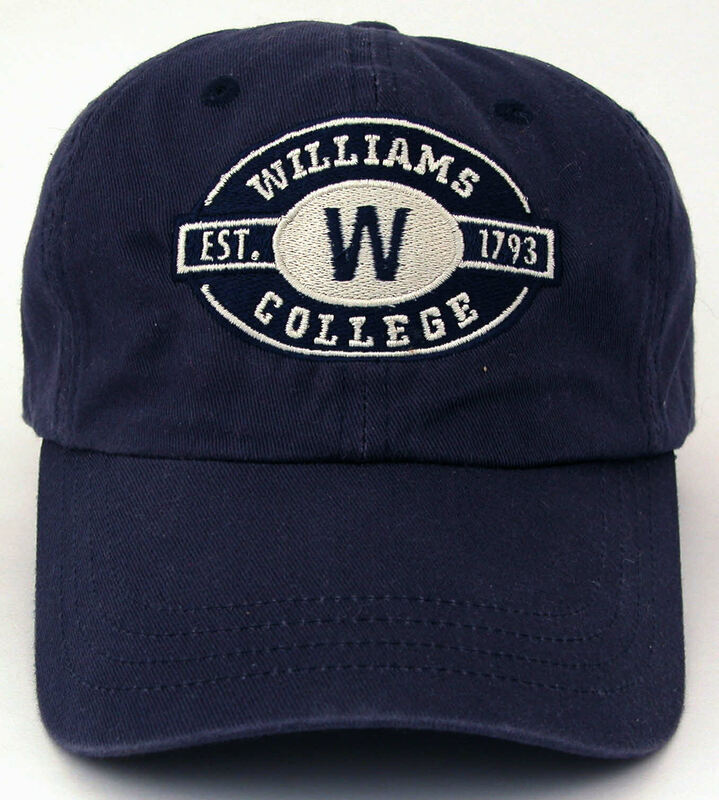 Adjustable hat with Williams College oval design. Navy (pictured), stone or gold. Hat from Champion with W, Williams College, Ephs on the front and Williams College sandwiched on the brim. Fabric adjustment in the back. One size fits most. Hat from Champion with W, Williams College, Ephs on the front and Williams College sandwiched on the brim. Fabric adjustment in the back. One size fits most. Black. Adjustable hat with GOT PURPLE? on the front and Williams College on the back. Purple. Adjustable hat with arched Williams College. Putty. Adjustable hat with arched Williams College. Purple. Adjustable hat with arched Williams College. Gold. Adjustable hat with arched Williams College. Navy. Adjustable hat with arched Williams College. White.